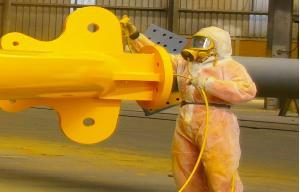 Tranzblast Coating Services offers Single and Multi-coat industrial paint systems. Application is performed in 5 purpose-built paint sheds providing an undercover painting capacity in excess of 10,000m2. Our Internal Quality Assurance System and inspections maintain a very high standard and quality workmanship, meeting your specifications and time schedules in this very demanding industry.